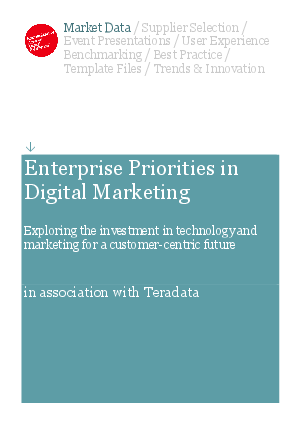 The Enterprise Priorities in Digital Marketing report, produced by Econsultancy in partnership with Teradata, provides guidance for the future through specific benchmarks from digital marketing leaders at enterprise organizations. The report focuses on the technology priorities of the world's largest companies, the strategies they support and the marketing budgets with which they're aligned. The report is based on an international survey of 402 senior marketers (director and above) from global enterprises. Respondents were from companies with more than $500 million in revenue, with 56% having revenues over $3 billion.